Craig Stevens (Abbott and Costello Meet Dr. Jekyll and Mr. Hyde) stars as Col. Joe Parkman, a military commander in charge of ending the insect’s reign, with William Hopper (20 Million Miles to Earth) as paleontologist Dr. Nedrick Jackson and Alix Talton (The Man Who Knew Too Much) as photojournalist Marge Blaine, assigned to document the epic battle between man and mantis. In July 1945, the United States tested the first atom bomb in New Mexico at the USAAF Alamogordo Bombing and Gunnery Range. A month later, the US used the new technology to devastate the Japanese cities of Hiroshima and Nagasaki. A new consciousness of the dangers of science and ethical and moral concerns about “playing God.” This new consciousness formed the subtext to countless science-fiction films of the ’50s. In Atomic Age films, scientists and high-ranking military men are often heroes, wielding nuclear technology to save the planet from mutants, alien invaders, and giant irradiated beasts. Films like 1951’s The Day the Earth Stood Still, The Beast From 20,000 Fathoms (1953), It Came From Outer Space (1953), The War of the Worlds (1953), Creature from the Black Lagoon (1954), Forbidden Planet (1956), and Invasion of the Body Snatchers (1956) all explore man’s uneasy relationship in some aspect. 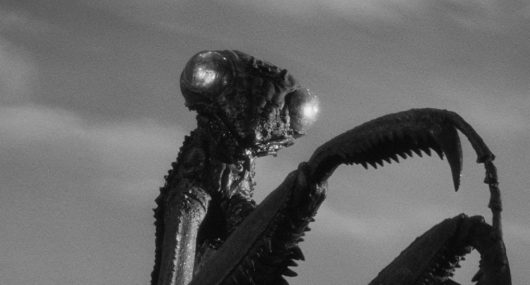 As for The Deadly Mantis, Juran’s creature feature follows in the massive footsteps of Godzilla (1954), Them! (1954), and 1955’s Tarantula. Who better then to pen this cautionary tale than Martin Berkeley, who wrote Tarantula and Revenge of the Creature. 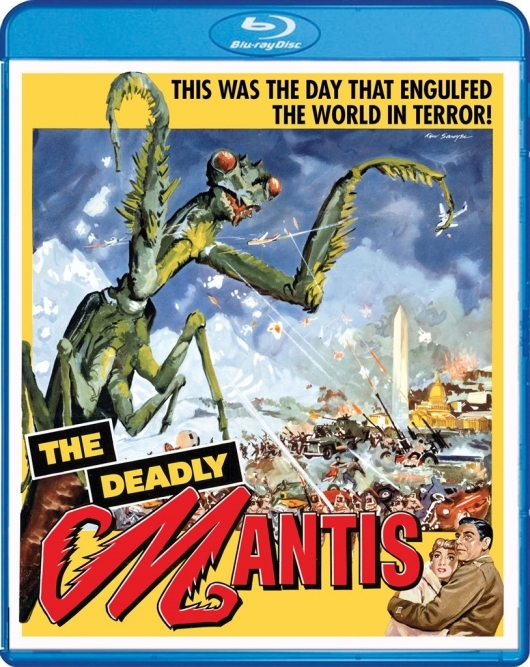 Unfortunately, The Deadly Mantis fails to elicit the excitement of those aforementioned classics. In comparison, it’s a pretty uneventful, by-the-numbers rip-off that feels as derivative as it does lifeless. 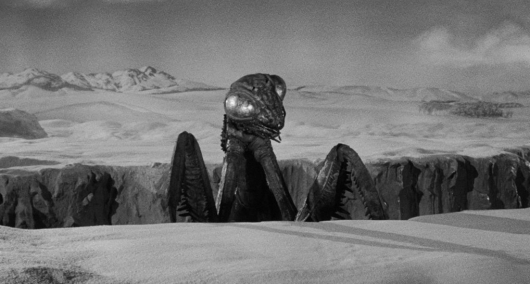 Aside from its less-than-convincing special effects and dull characters, The Deadly Mantis‘s greatest claim to fame is being featured on an episode of Mystery Science Theater 3000. Like so many ’50s B-movies, Juran’s cheese-fest is best experienced with the commentary of Mike Nelson, Crow T. Robot, and Tom Servo. Luckily, that 1997 episode is included on this disc! Also included is a new audio commentary track with film historians Tom Weaver and David Schecter that provides a lot of interesting insight into cinema’s Atomic Age. While I can’t necessarily recommend The Deadly Mantis as a forgotten classic getting a much-deserved second look, I will say that Scream Factory has done an admirable job in restoring the film, with a new 2K scan of the original film elements. The film looks and sounds great – well, as good as a low-budget movie about a man-eating papier-mâché mantis can look – and I’ll be honest, the gorgeous cover art (pictured below) is almost worth the price of admission alone. The Deadly Mantis is now available at Amazon. For more reviews of Scream Factory releases, click here.